This set was created in an effort to be as close as possible to the strings Jimi would have used. Features round core wound basses that offers unbelievable tone and sustain paired with the silvered-steel trebles. 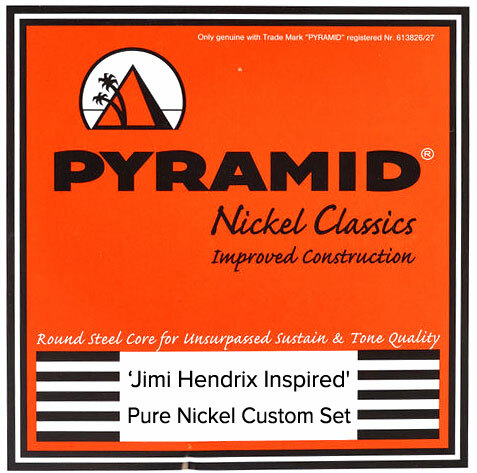 Read about how and why we created these Jimi Hendrix Inspired strings in this SBM blog article. Fuggin twangy and bendy. Good as hell. I recommend these for any style that requires bending and shredding. A pleasure to play. Hey, I would never have guessed that string combination would work but it feels and sounds great! These strings are easy on my fingers. The tone on the bass strings seems cleaner. I will be putting them on my other electric guitars when its time to change strings. Got to see how they sound when I tune 432hz or Eb. Yeah I like em'. I've tried a lot of strings over the years and have never really settled on any particular kind for my electric guitars that I felt was stood out above the rest. I'm done searching. There is such a crispness and clarity to these strings that stands above anything else I've ever tried. A Good deal!!! Like combining three sets of strings in one .Thanks for the Jimi string sets!!! Q: Do these strings come in a sealed gas-filed plastic envelope like D'addarios or are they the kind in paper envelopes in a non-sealed plastic package (thus subject to rust while stored)? Thanks. The strings are packaged in paper envelopes not sealed pouches like D'Addario.